Work conjures the hidden structures that underwrite production. Extending Goldenberg’s ongoing dialogue with refuse and waste—the residue of overproduction and constant consumption—this new body of work shifts the focus away from the material excesses documented in her earlier sculptures towards the process of production itself. 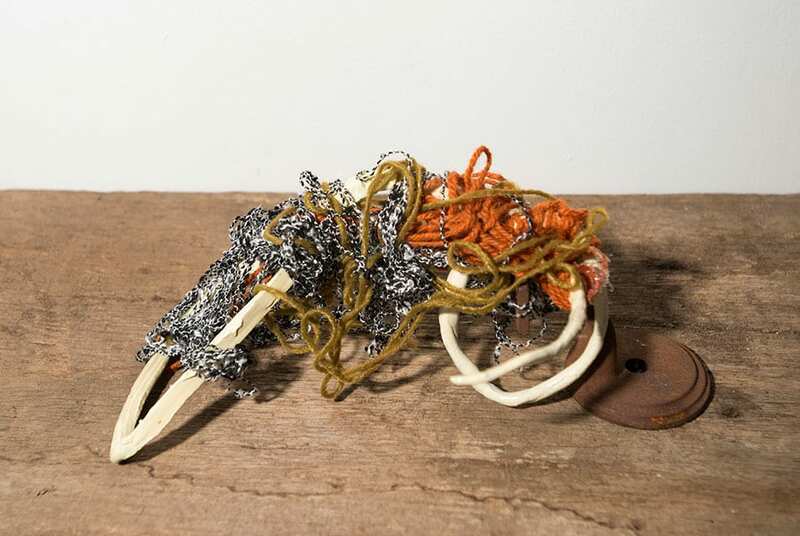 Haunting and skeletal, the pieces point in several directions at once: histories of factory and domestic labor, the intersection of aesthetics and utility, a refusal of work, a conflation and confusion of the roles of artist, worker, rag-picker…. There is something distinctly narrative here, but the openness of the work itself does not lead the spectator in any predetermined direction. Goldenberg’s sustained engagement with found materials adds a temporal dimension to this now familiar aesthetic of minimalism, producing a conceptual density that is neither affected nor didactic. This new body of work includes several large, empty looms and wall-mounted string and textile works, as well as the delicate nylon and wire sculptures that have been central to the artist’s practice for years. BIO Suzanne Goldenberg received a B.A. in Film Studies from McGill University and an M.F.A from the Maryland Institute College of Art. She attended the Aljira Emerge Program, NJ and has received residencies from LMCC’s Swing Space program; Rotunda Gallery/BCAT Residency, NYC, NARS Foundation, NY and the Edward Albee Foundation. She is a recipient of The Gottlieb Foundation Grant. Her work has been exhibited internationally and in New York at STOREFRONT Gallery, Art in General, NYC and CANADA Gallery, NYC and most recently, Gallery Molly Krom, NYC.